I’m doing my best to make do without my CSA bin for the past month. And that means I’ve been doing a lot with some products and foods that I have in my fridge and freezer. My freezer happened to have an open box of Sophie’s Kitchen Gluten Free Vegan Breaded Scallops and this amazing corn that I cut off the cob and froze for later use. My fruit bowl is holding one of my favorite things in life…avocados. And yesterday, I purchased an onion for use in my previous recipe. 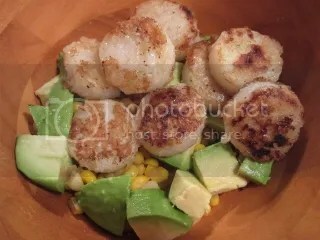 So, when I spotted a recipe on Health.com for a meal that involved fresh corn, avocado, scallions and scallops, I knew I could easily adapt the recipe to use ingredients I had on hand, and keep it vegan. Of course, if you eat seafood, feel free to use regular scallops. With the seasoning and the fresh vegetables, this was one fantastic meal. In a small bowl, toss avocado and lime juice. Sprinkle scallops with salt, pepper, and 1/2 teaspoon cumin. Heat oil in a large nonstick skillet over medium-high heat. Add scallops; cook, turning once, until golden and cooked through (about 3 minutes). Transfer scallops to a plate. Add corn, scallion, white wine, and remaining cumin to skillet; cook corn until tender, stirring constantly (about 2 minutes). Spoon corn mixture onto 4 serving plates, add avocado and top each with half of the scallops. This was one fantastic meal. I loved the healthy fat that came into the dish with the avocado. The seasonal corn was an amazing ingredient on its own, but when seasoned and cooked with all the other ingredients, it became elevated. The scallops, simply seasoned with salt, pepper, and cumin made the perfect protein and topper for this dish. Give it a try! Vegan, vegetarian, or pescatarian…you’ll really enjoy this meal. I’ll definitely be making this again! This entry was posted in Clean Eating, Entree, Food, Frozen, Gluten-Free, Recipe, Vegan, Vegetables, Vegetarian by The Celiathlete. Bookmark the permalink. Vegan scallops!?!?!? SHUT THE FRONT DOOR! I had no idea!!!! They are amazing. Sophie’s Kitchen does fantastic vegan seafood! !